And just soze ya know! My birthday is this coming Friday and a contribution (even of just $5) to the Learning to Drive crowd-funding campaign would be the best birthday present I could ask for! 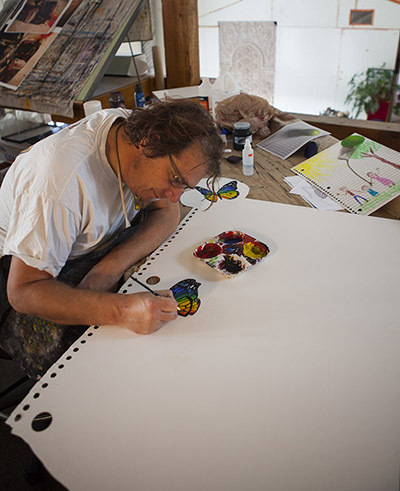 I'm very excited to be busy building on the "inner child" series and have completed two new pieces thus far for 2014. These pieces include acrylic paint, archival pigment and crayon on plastic sheets that I cut, drill, heat and form to emulate giant pieces of loose-leaf paper. (right) - "sunflower" - 50"x40" mixed media. 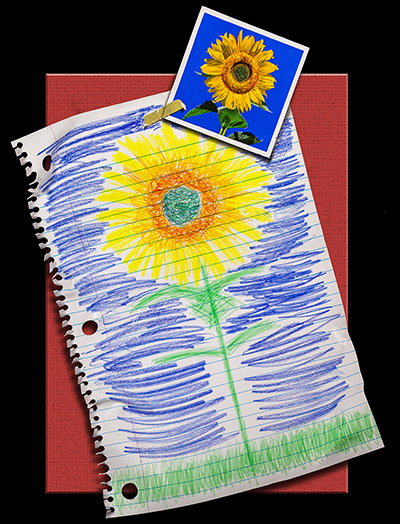 After cutting, drilling and priming the plastic to replicate a sheet of wide ruled, loose-leaf paper, I painted the photo-realistic image of a 'photograph' of a sunflower and painted the strip of masking tape on as though it were taped to the page. Once that was all done, I used an archival pigment pen to portray all of the blue lines and the pink margin line. Then I draw the child-like representation with actual crayon. This is all sealed with two different kinds of medium and varnish to protect the images and give them a varying finish. Finally I use heat and pressure to mold the plastic into curls and wrinkles and give it the appearance of having just been ripped from a spiral notebook. (below) - "butterflight" - 50"x40" mixed media. Below you can see some of the progression of creating one of these pieces, as well as a size-reference image to give you a sense of scale. 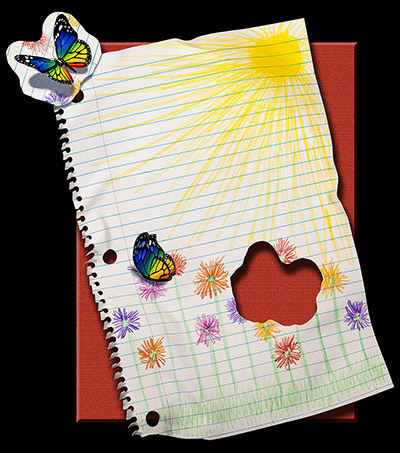 For "butterflight", I added the effect of one of the butterflies having torn out a piece of the paper and carried it away. 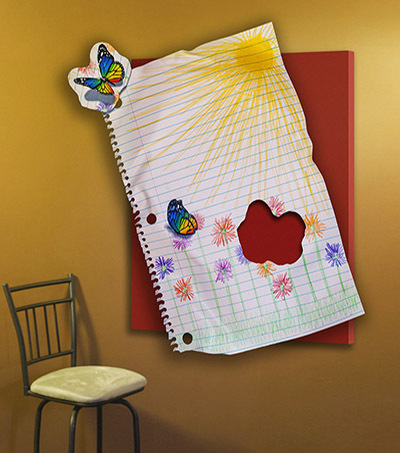 The 'hole' in the paper is actually just painted on. Reintroducing "aspens"! 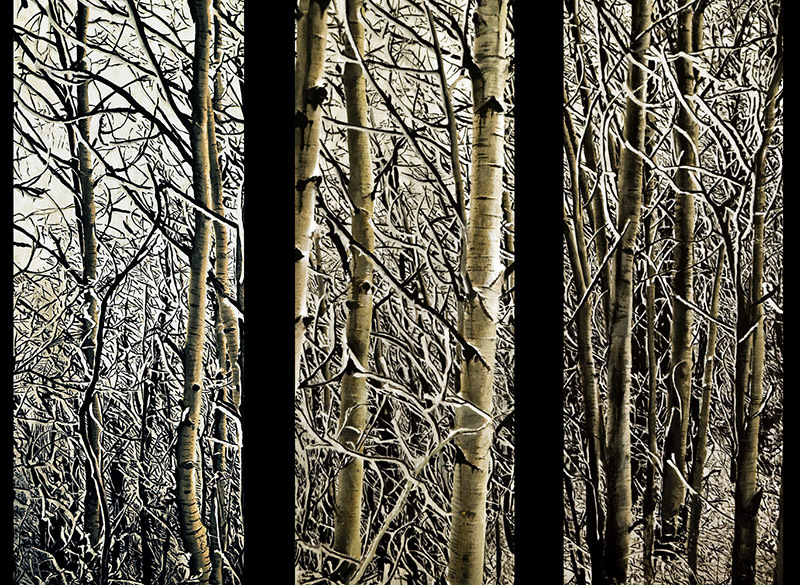 (left and below) "aspens" - tryptich of 3, 48"x16" acrylic on canvas paintings. This original set is hanging in the home of a friend of mine here in southeastern Arizona. In fact, his son is the one who took the original reference photograph from which I achieved the painting and who is also gearing up to direct our short film "Learning to Drive"! The image below gives you a clearer sense of how the images look. I first displayed these two years ago shortly after I finished the original paintings, but they've been getting so much attention lately on Facebook that I thought I would share them again here for those who've not seen them. 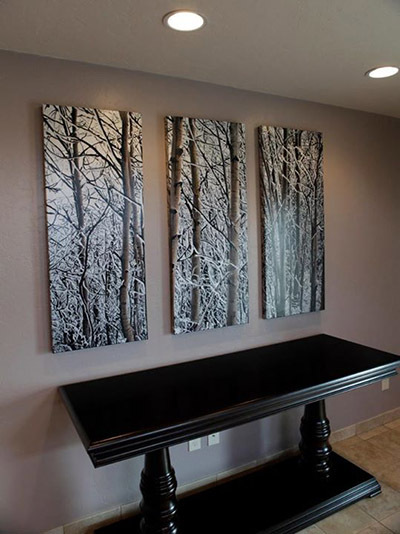 These are available in various sizes from 48"x16" down to 9"x24" panels and varieties in between. They can be purchased individually or as a set! to help us raise funds for "Learning to Drive"! As mentioned, I have never felt as passionately about any of my life's creative adventures as I do about this one. I think if you take the time to check out the project at IndieGoGo (click on the logo below), you'll find the project worthwhile and exciting to be a part of! Studies have shown that one of the most effective ways of affecting social change is through film! This is particularly true if the audience doesn't feel like they're being preached to, but rather are being entertained. With Learning to Drive, my focus has always been to tell a unique and engaging story. EVEN $5 helps us get underway! The featured 'perk' at the campaign is just $5, and if you can't yet buy a piece of art through the campaign, please pitch in $5. There are over 5000 people subscribed to this newsletter. If just 100 people would pitch in $5, it would not only add $500 to the effort, but it would create energy for the campaign that encourages IndieGoGo to more prominently feature our project and expose it to thousands of additional people looking at crowd-funding projects! Learning To Drive - crowdfunding campaign intro video from Roderick E Stevens II on Vimeo Hey there! 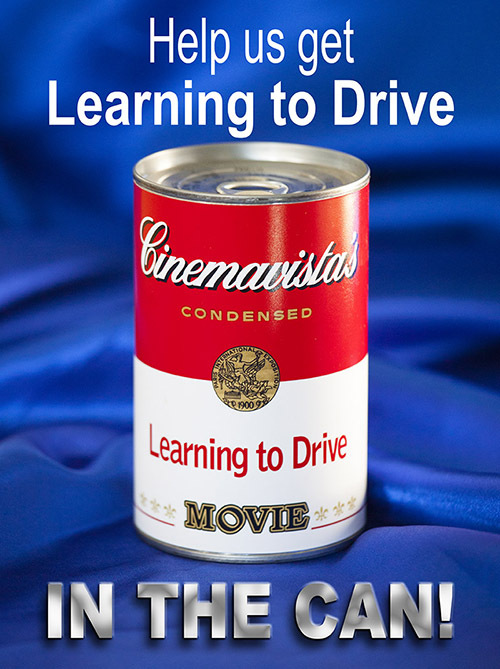 Thanks for checking out my crowd-funding campaign for our short film called “Learning to Drive”. Many of you know me as a fine artist with my photorealistic paintings and mixed media wall sculptures at www.yesitsapainting.com . Some of you also know that my ‘other’ day job is in film. That’s where “Learning to Drive” comes in. This is a story I’ve wanted to tell for 15 years which at its core, is inspired by my ever evolving relationship with my cognitively disabled brother, Andy. While this may not be unfamiliar territory in film, what makes our project exciting and unlike anything we’ve seen before, is that we’re especially interested in portraying Andy’s point of view, rather than my own. Years ago, a video was created to introduce people to Andy and his unique take on the world. Following is an excerpt from that video. Meet Andy: The Inspiration for "Learning to Drive"
I’ve been working on a feature length screenplay off and on over the years and am very excited to develop that project, but I feel the best way to move forward for now is to shoot a short film version in order to explore this unique perspective and use this as a catalyst for the feature project. I have written and will produce the project, but I’ve retained the team of Josh Greer and Daniel Cooper to co-direct it. If you look me up on IMDB, you’ll find the majority of my credits are as a cinematographer on over 25 feature films, but I’m asking my friend and Gaffer turned Director of Photography, Danny Gonzalez to handle the lens on this venture. Again, you can learn more about all of the key production personnel in the updates for this campaign and as we get more people on board I will keep adding to those links. We are all very excited about building this project together and feel we have something worth saying that will engage and entertain the audience. Many people have already agreed to work for far below their usual wages and we’ve even had some equipment offered for free. While we hope to raise the full amount necessary to complete the film and get it submitted to film festivals, our immediate goal is to raise at least the minimum amount necessary to get the principal unit of this short film ‘in the can’. Following is an approximate breakdown of our minimum budget. Assuming funding goes well, we’ll go into production in the spring, likely with a 7-10 day shooting schedule in Southern California and Arizona. I’ll then do my spring tour of art shows, where many of you first met me and dive into post production and editing in the summer of 2014, after which we’ll begin submitting it to various film festivals like Sundance, Toronto, Telluride etc. Why make a short film? Making a short film is rarely, if ever a profitable venture. The chances we’d actually make any money from the sale of this film are slim to none, though I am presently exploring a myriad of digital and cable distribution options. The point of this project is to explore a new perspective and hopefully create something that successfully proves the viability of producing a feature length version. I’ll then bring the completed short film, as well as the finished feature length script of “Learning to Drive” to the attention of numerous producers with the intent of getting a larger production company involved in backing the feature version. Of course I'm hoping that you will get great satisfaction out of being a part of this project and seeing it take shape, but since many of you are familiar with my fine art I’ve decided to make that a significant part of our incentives for contributions, along with fun and memorable items from the production itself and in some cases, even my famous chocolate chip cookies! ALL contributors will be sent links to a digital download of the completed film when available, as well as the film's soundtrack and a .pdf of the final shooting script. And btw, each of these contributions includes shipping to anywhere in the continental U.S. Those outside the contiguous 50 states, please contact me at roderick@yesitsapainting.com to arrange for shipping to your location. Please spread the word and give us input! I very much look forward to your feedback, including on what other incentives you might like to see in order to help us reach our goal. I’ve included all the particulars, including frequently asked questions, links to more information, and how to contact me in this campaign. Thanks for checking us out and being a part of “Learning to Drive”. Please help us gain exposure by liking, following and sharing our campaign. Remember, if you can’t contribute just yet, please share our campaign with your friends! 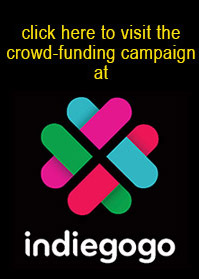 The more interaction between you, the public and us the production, the more IndieGoGo features our efforts. One of the biggest challenges in film production is assembling a team of people who are experienced, professional and enjoyable to work with. As a cinematographer on over 25 features films, I've been grateful to develop rewarding friendships and great working relationships with top notch crew that love the work and come to set with a great attitude! The production team for "Learning to Drive" consists of seasoned film industry professionals who have worked together on numerous projects over the years. Michael has always wanted to drive a car, just like his mother and his brother Red; the problem is he has Down syndrome. 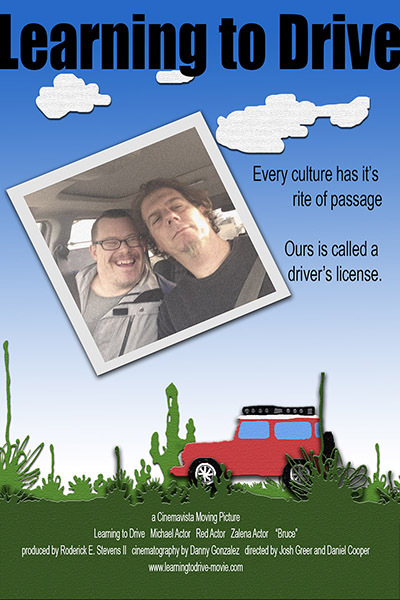 “Learning to Drive” follows the struggles of two divergent brothers during a road trip to release their mother’s ashes at the Grand Canyon, during which Michael is determined to convince his caring but controlling brother Red to teach him how to drive. In a dramatic, sometimes humorous turn, he takes it upon himself to prove his resolve, forcing Red to face his own fears, let go and just be Michael’s brother. ChevyFeaturette1 from Roderick E Stevens II on Vimeo. a sample of one of the many movie poster ideas we've been working on. Of course the finished version would include the actual cast from the film, but this work in progress shows me with my brother Andy, who is the inspiration for the movie. Following are the 'Perks' available presently on IndieGoGo. If there is something YOU WOULD LIKE TO SEE on here, just let me know! $5 - Kick the Tires! Every little bit helps! And for your contribution towards this project, you'll receive links to a print sized 'one-sheet' (8x10 of the movie poster) and digital download of the completed film when available, as well as the film's soundtrack and a .pdf of the final shooting script. Thanks bunches for your help! $15 - Fill 'er up! For helping us get this project fueled, we'll send you a signed print of the 'one sheet' (8x10 version of a working poster) in addition to the download links for the completed movie, soundtrack and script. This already includes shipping within the contiguous U.S. states. $25 - Start the engine! Similar to above (Start the engine) but you receive FOUR signed prints of either “Yes It’s a Painting” artwork or production stills, or a combination of each, plus the signed production ‘one-sheet’ poster. Remember, any www.yesitsapainting.com prints will be shipped promptly, while production stills and the 'one-sheet' will be shipped sometime after principal photography has wrapped. $150 - Getting in gear! For your generosity, not only will you receive 4 signed prints of your choice of artwork or production still (like above), but you will also be shipped a director’s chair back with the “Learning to Drive” production logo and 12on/12off logo AND a production t-shirt with the LTD and 12on/12off logos, plus a link to a digital download of the movie’s soundtrack music, a pdf of the finished script and a signed production ‘one-sheet’. $200 - Givin it gas! 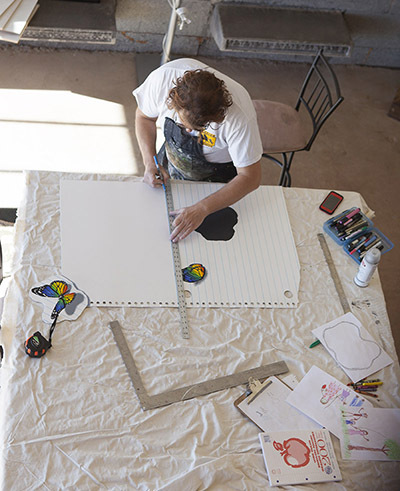 For helping accelerate the project I'd like to offer you a seat in a painting workshop held in or around Sierra Vista, Az. in February, 2014. This is a 2 day workshop in which we complete a painting together. I will work in my familiar 'photorealistic' style on a subject that is challenging, but attainable while I answer questions and work with the group and individuals to help them complete their own paintings. This is limited to a maximum of only 10 seats! Now we’re moving! And to say thank you, I’d like to ship you a medium, signed & numbered, limited edition canvas reproduction (unstretched) of any available artwork at www.yesitsapainting.com. Additionally, you’ll receive 2 production t-shirts, 2 signed prints of artwork or production stills, a link to a digital download of the movie’s soundtrack music, a pdf of the script, a signed production ‘one-sheet’ AND YOUR NAME LISTED IN THE “Thanks To” credits. For such a great boost, you’ll receive TWO Large , signed and numbered, ltd edition, canvas reproductions (unstretched ) of any available artwork, an invitation to visit the set, signed production binder incl. numerous productions stills, script, the soundtrack, and additional notes from the production, plus 2 director’s chair backs, 2 prod t-shirts, 4 signed prints, YOUR NAME in the “Made Possible By” credits, and most importantly – a DOZEN of my famous chocolate chip cookies! The following gives you an idea of how various levels of fund-raising beyond our minimum goal could impact the productions. Josh started in the industry assisting in the camera department for Roderick and has since worked on dozens of feature films for over a decade including The Counselor, Oz the Great and Powerful, and Underworld: Awakening, always with his eye on directing. He teamed up with long time friend Daniel Cooper to start directing music videos and short films including 2012’s ‘Turkey In the Straw’. Besides gaffing numerous projects with Roderick, Danny has worked in the camera and lighting departments of numerous major films including ‘Pirates of the Caribbean: On Stranger Tides, The Hangover Pt III, and Captain American: Winter Soldier, all the while honing his craft as a cinematographer on numerous short films. Always Roderick’s first choice for the crucial task of recording production sound, Greg has been busy for over 15 years working on films such as Argo, Underworld: Awakening, and Law and Order: LA.